Sunroom, Deck, and Gorgeous Backyard! Move-in ready 4 bedroom home with over 2750 square feet on a 1/3 acre fenced-in level lot, and located in an established, mature neighborhood in Simpsonville that's convenient to Woodruff Rd, Hwy 14, and much more! 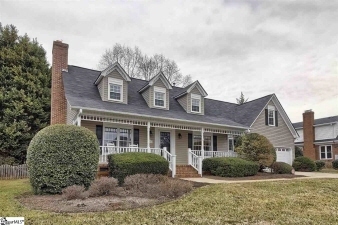 Curb appeal and charm greet you from the moment you set eyes on this home - the large covered front porch extends approximately 36 feet! The main level offers a formal dining room plus a large great room, with a gas logs fireplace, that extends into your sunroom. You'll love the eat-in kitchen with a bay window that looks out to your yard, plus granite countertops, stainless steel appliances, and a walk-in pantry. Dual staircases in the home take you upstairs where you'll find four bedrooms, including the master bedroom that offers a large walk-in closet and an attached 5 piece bathroom with dual vanities and a separate shower and jetted tub! 2 out of the 3 secondary bedrooms have walk-in closets! Too many other features to list - schedule your showing today!